After the Polestar 1 hybrid, Polestar has officially entered the all-electric segment with the debut of the Polestar 2 fastback. In June 2017, Volvo had rebranded its performance house Polestar as an electric performance carmaker. In October 2017, the brand's first hybrid performance vehicle, the Polestar 1, had made its debut. Now, the company has taken the all-electric route for its next creation – the Polestar 2. Claimed to be the 'first' genuine competitor to the Tesla Model 3 by its creators, Polestar wants to make electric performance vehicles more accessible to car buyers. Coming to the car itself, the Polestar 2 is a premium, five-door fastback that’s powered by two electric motors. 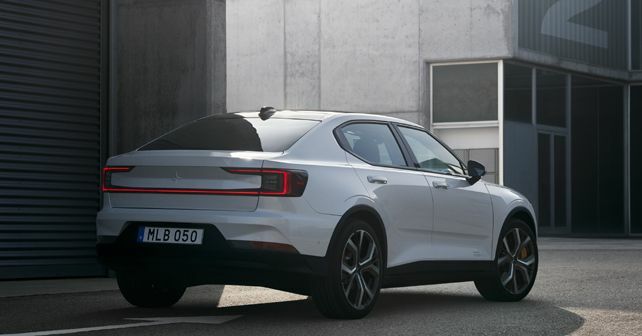 With a 78kWh battery pack and a targeted range of 500km, the Polestar 2 is built on Volvo's Compact Modular Architecture (CMA) platform, which it shares with the Volvo XC40. With the two electric motors sending power to all the wheels, the Polestar 2 produces 402bhp and 660Nm of torque. This means that it can do a 0 – 100km/h sprint in less than 5 seconds. In contrast, the top-spec Model 3 Performance produces 450bhp and 639Nm of torque. To keep the NVH levels at a bare minimum, the 27-module battery pack of the Polestar 2 has been integrated into the floor. Along with a 3.7dB reduction in road noise, this also helps in making the chassis more rigid. To add further sporty credentials, the Polestar 2 can be ordered with an additional Performance Pack that improves the driving dynamics with the help of Öhlins dampers, Brembo brakes and unique 20-inch forged wheels. The Polestar 2 also gets a one-of-a-kind infotainment system powered by Android. Not only does it make the Polestar 2 the first car in the world to have this system but it also brings embedded Google services to a car for the first time, including the Google Assistant, Google Maps with support for electric vehicles and the Google Play Store. Natural voice control and a new 11-inch touch screen display further enhance the user interface. In terms of design highlights, the Polestar 2 gets Pixel LED headlamps and proximity lighting. Further, Polestar's signature frameless ORVMs and its unique illuminated Polestar logo (reflected on to the car's panoramic glass roof) add a stylish flair to an otherwise practical car design. The Polestar 2 will make its first public appearance at the upcoming Geneva International Motor Show in March. For the latest updates & reviews, subscribe to our daily newsletter & YouTube channel, like us on Facebook and follow us on Twitter & Instagram.